Initially we went round and spent XP - this was pleasantly quick to do. Takeshi spent all his allowance on ring increases (allowing him to get back to the Earth 4 he had when we went through character creation the first time - I hadn't noticed the 'cap' on skills and stats at that point) to better suit his Large Stature. Mishiko increased her Earth and Air rings (those being the rings for her main 'offensive' invocations) and picked up Biting Steel, being pretty much sold on the description of "that guy from the Brotherhood without Banners in Game Of Thrones"
I'm not sure why starter adventure is intended to be for school rank 2 characters? I guess you may find that the adventure in the actual rulebook is different (that's been the case with quite a few of the SWRPG books, where there's been one adventure in the beta, one in the intro box set, one in the rulebook and one in the GM's kit that sort of form a 'set'). We also rolled on the 'discord wheel' with both rolls ending up landing on Hida Takeshi, who was extremely not pleased by this. Fortunately, he'd just increased his void rank, so he at least got the extra void point. Ishikawa Mura doesn't appear that I can see, but with a name meaning "Rock River Village" and being about 6 days ride (so 100 to 200 ish miles?) from the 3rd watchtower would suggest somewhere on the riverbank in the highlands between Hisashiyama Mura and Sunda Mizu Mura. The Moshibaru palace isn't on the map either (not that you go there), but the third watchtower is - apparently it has a specific name, Shiro Hiruma (Daylight Castle). The magistrate essentially announced that he was 'splitting the party', which led to the inevitable (and pre-accounted for by the writers) question 'shouldn't we be going with you'. This goes double since Takeshi and Tsubasa are assigned as Yojimbo bodyguards to the Magistrate, so leaving him when he's going deliberately into danger seemed odd. The stock answer sort of worked, but I added that since he was hunting a mahō-tsukai, swords wouldn't be of much use - he would be acquiring the services of some of the Kuni Purifiers to aid him, whilst sending Mishiko as an aide with them in case Keinosuke had any supernatural skills or tainted artefacts of his own. The party decided to split up and deal with three issues separately. Mishiko went into the inn, telling Yoshika to show her to the room, and questioning him about the events. She also searched the room, failing the medicine check to read any signs in the blood spatter, but picking up an opportunity (and finding the whetstones). Once Tsubasa pointed out the incense burner, she then carried out a Commune with the Spirits ritual (somewhat spoiled by the ghost of Hanake, her brother, appearing crouched in the corner silently screaming in terror), which let them pick up that (a) Hida Kayo had been not just killed but sacrificed in some sort of mahō ritual, which somehow involved his bloodline. Tsubasa and his attendant went to collect Hida Kayo's remains and - reluctantly - question the burakumin at the same time. The command check was very easy, but he picked up a disturbing amount of strife (presumably the capitol-born, crane-trained samurai finding the Hinin quarter as distasteful as you can imagine*). He subsequently went back to the inn, and helped Mishiko - having a good Martial Arts (Melee) and knowing about Kayo's wounds he was able to pick out the clues in the blood spatter Mishiko couldn't interpret. He also spotted some incense burners, leading to them realising that mahō had been involved. Takeshi went to question the rest of the villagers (and ended up meeting Mirumoto Chiaki, who was meditating in a grove on the edge of the village - relocated so each of them had a couple of things to do). Dealing with the villagers was easy enough - command (earth) works pretty well when you're a Crab samurai ordering peasants around in Crab lands, even with no command skill (although there was only so much they could tell him, though "heading towards the wall" covers a pretty wide area, after all). Chiaki was a different matter, and a combination of no courtesy skill, Irrepressable Flirtation and Bluntness left him very close to causing offense, with two successes disappearing in the reroll and only the single remaining explosive success rerolling into a second success let him pass, with no less than 5 strife landing on him whilst trying to not to say something inappropriate. The trio then set off for the wall in pursuit of Kienosuke, taking Hida Kayo's remains with them. It took them seven days (via a couple of villages and a Crab sentry post near Kyūden Moshibaru to end up at the Third Watchtower, with Akodo Tsubasa' rank of skulduggery proving useful to help them track Kienosuke more quickly (thinking to flag down and question a couple of travelling tinkers who saw him camp away from a nearby village). In the process, they heard that a Twenty-Goblins-Winter had been declared (Hida Takeshi explaining what it was**), and pretty much already suspected what they were going to find on reaching the Kaiu Wall itself. The evidence of the ongoing battles around the watchtower were evident in troop movements. Following some advice I gave myself, I noted that Hida Hiromichi had lost a lot of his officers in the recent fighting, and without his staff he's struggling to reorganise and manage the watchtower's garrison. They presented themselves to Hiromichi, who confirmed that Keinosuke was now a Crab Clan Samurai. He took charge of Hida Kayo's remains; saying he would keep them in the Third Watchtower's shrine until he could identify where they should be sent; he had served alongside Hida Kayo for some time but didn't know any details of his family - but said he would inquire where they should go and send them on. He also let them know that whilst Kienosuke might be a criminal, at the moment he was obligated to protect him without testimony. He suspected the accuser would be challenged and warned them to be ready. At this point we finished for the evening. To be honest, the system worked well. It'll take a bit of time to get our heads around the approaches (fire water earth) as opposed to (strength intelligence agility) but it seemed to work well, and the dice mechanics were simple and elegant. Disadvantages and advantages both came into play, and people both passed and failed checks which impacted but never derailed the story. Flicking back and forth in (what is, to be fair, a .PDF printout) took a while - specifically I knew because I remembered reading that at the end of a scene you recover strife equal to your water ring, but I couldn't find it when I wanted to check (it's on page 17), whilst the rate you heal wounds is in Harm and Healing on page 168. I think learning where things like this, and the opportunity tables, are, will be the main thing to affect the speed of play. "He must be a samurai!" "He hasn't got s*** all over him...."
** Technically his player miming talking whilst I read out the text and saying "yes, that!" at the end. The Discord Wheel turned, the fickle finger of fate pointing at Shiba Mishiko. Hida Takeshi confronted Keinosuke, which turned into an angry challenge. Given the whetstone box, and his decent Earth ring he was able to calmly talk Keinosuke down to a duel to first blood with ceremonial weapons only (which sadly for him meant no otsuchi!). The duel took place on an open space atop the wall and....took too long. Takeshi won, but it took over half an hour to resolve. Now, I have no problem with a dramatic duel taking a while, but the problem with a formal duel (unlike a mid-skirmish challenge) is that whilst it's happening, the other PCs aren't doing much if anything. Takeshi was pretty much the problem child mentioned before in reference to high earth/water character's ability to drain off strife at a high rate, which meant that things kept on for some time. Even with Keinosuke (i.e. me) guessing right twice in a row what ring he would pick for centre-action strife, he only once ended up with strife equal to, and not exceeding composure, and that was as close as he got. Eventually, I just went with a void point assisted, iaijutsu fire stance strike to get things happening before the players got bored. Takeshi took a fair amount of wounds, despite his lacquered armour (fortunately also ceremonial!) and landed a fair amount of damage himself. More importantly, he got a pair of opportunities and landed an injured leg critical, impacting Kienosuke's ability to use water stance. There was a couple more exchanges of centre actions and strikes, before Keinosuke eventually landed a strike in air stance that did a few more wounds but not enough, and Takeshi landed a hefty earth strike action, incapacitating and delivering a prone result - presumably sending the ronin flying quite some distance. Afterwards, they went to see Hida Tonomatsu, and got the lay of the land (with Tonomatsu making it clear that she welcomed their advice, but it was her decision on the plan to be followed, and that she didn't have time to contact all her commanders). Shiba Mishiko had a chance to talk to Kuni Terumi - the Shujengas getting along well once she agreed to the cleansing ritual (which required a certain courtesy check to explain the haunting by her brother was not shadowland taint masquerading as a friendly face). She was nevertheless a little irked that it took too much time to go and talk to the quartermaster*, but Terumi was useful. Having been tasked by Hiromichi to figure out where Hida Kayo's remains should go, she was able to let the PCs know that he was the last member of his family. Putting two (last of his family) and two (maho blood magic) together, they found out about his ancestory's defeat of Kazanagan no Oni, and Mishiko was convinced - but equally aware Terumi's plan would be a very hard sell for Tonomatsu. Hida Takeshi (still in rather a lot of pain and much annoyed to discover there are no rules for recovering wounds via 'first aid' with medicine skill!) spoke to Kaiu Masae, helping fix the wall, and was informed about the trap built into the repaired wall. He also spoke to Hida Tsukiko, and was left with a conflicted view about whether they should fight from the wall or not. 6 goblins popped up from ambush at the edge of volley range (5) but lost the initiative because even their focus was only equal to the duellist's vigilance. Landing a hit with an unslung naginata did what you might expect (squelch), and a decent chunk of strife (+1 for a wargear weapon) landed on the goblins. A subesquent fire stance strike assisted by the warhorse landed a faintly ridiculous 15 damage once strife and explosive success resolved on a second goblin. This continued, and the rapid reduction in the squad's composure, combined with the strife being poured on, resulted in the last goblin fleeing before taking a Yumi head-shot from Yukito (who appeared over the same ridge to investigate. The 'bonus success on movement and assistance for combat' feels good too. Mounted combat is an important component of medieval narratives and a lot of RPGs do it badly. Not really needing the statline for the warhorse speeds things up immensely. He interrogated Yukito, learning about the strength of the incoming army and asking about its leadership - finding out about Teeth-Taker and the suspicion that there was at least one shaman amongst the goblins, plus getting a quick background on the Dark Moto. The party met up to figure out what their recommendations to Tonomatsu would be - I don't know what they decided, as we finished at that point and I wasn't in the room. Skirmish combat was fast, simple and worked well with a Samurai facing a squad. The cavalry rules are simple and elegant. The fact that they can't shed off strife with opportunity, combined with their communal composure dropping as squad members get killed provides a nice morale mechanic. I find myself wondering if some sort of 'overkill' mechanic might be good. When a close-packed group of infantry gets hit by a naginata-wielding heavy cavalryman, and his attack lands a truly ridiculous number of bonus successes (enough damage to kill 3 goblins simultaneously!) getting a single kill feels anticlimactic. It might be worth some sort of generic "opportunity when attacking a squad at range 1-2" to allow you to land multiple hits simultaneously in the way good rolls in 40kRPG could chop up multiple horde members. Duels felt too slow. Finishing blows are terrifying, but creating the opportunity felt too hard because you can burn off strife whilst centering so easily. Whilst the system is no slower than a skirmish, a duel needs to be faster because the other players don't get to do anything during a duel; having your other players sit there for too much real time is unacceptable. By all means have three-to-four turns represent half an hour of meaningful staring through drifts of cherry blossoms, but a couple of rounds should be enough for most duels. The way Showdowns work in Edge Of The Empire (an observation-ey 'assess' round, a social 'staredown' round, then the first more-lethal-than-normal combat round for whoever wins a nerve check) works well and feels VERY samurai. Plagiarise with pride! 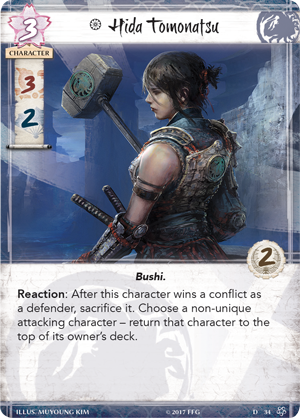 The staredown is a good idea, but Hida Takeshi never felt the need to play; he needed to bid a couple of strife more to even equal Keinosuke's initiative, so why not just bid 0 and accept you're going last? A way to create a constant feeling of ratcheting dramatic tension might be to use the staredown, but mandate a minimum strife bid. With most combat-esque characters having a composure of ~10, being forced to bid at least 2 or 3 strife a turn, for example, makes an outburst much more inevitable, and it becomes a question of managing when the finishing blow comes and who eats it, not avoiding it entirely. Provoke doesn't feel....terribly provocative. Yes, it cuts the TN to hit your target, but because it's TN3 and Centre is TN1, and your opponent gets an opportunity to centre between when you provoke and when you strike, you're always on the losing end of the stick. Giving it a secondary effect would be good; Centre is good because it ups your defence and dumps strife on the opponent. Either allowing you to force your opponent to shift stance, or preventing them taking a specified stance, or forcing them to make an attack action next turn, were all suggestions we came up with. * Prompting a Phoebe-from-friends "Stop Cleansing My Aura!" Hida Tomanatsu and Nezumi are both in the Crab fiction. Thanks for letting me play vicariously through you with these posts. This time the players were joined by Kaiu Daisuke (a second Hida Defender I quickly knocked together for a new player). He didn't really follow what was going on but has basically zero RPG experience regardless of system. Ideally I need to sit down with him and explain things in slow-time, which I didn't have a chance to do. I put Daisuke supporting Gakuto (since he was a member of the Watchtower garrison and would support the advisor he knew). The conflict was....okay? I guess. None of the players have any especially useful shuji. I can't see any default action equivalent to Centre in a duel - especially with Fire opportunities being reigned in, I'm not sure how anyone who's not an Ikoma bard is supposed to achieve a Discredit objective easily. It basically boiled down to going round the table, everyone doing a persuade action, until the appropriate number of rhetorical points had been reached. The stances did matter - Shiba Mishiko doing a proper 'epic film speech' which actually won the day at the start of the second turn - using her higher status and focus to interrupt Gakuto (because of the way initiative works in intrigues) and make an impassioned plea that the shadowlanders are coming, and there was no more time for debate; they needed to be ready now. With multiple [explosive success][strife] results exploding into even more [explosive success][strife] results, she basically won the argument on her own in that moment. The objective itself feels a little odd. Given that Gakuto had a henchman in the form of Daisuke, he still only got to about half a dozen rhetorical points - but the thing is that there was never much of a chance he was going to win, and if he doesn't it doesn't matter if he accrues one point or eleven. Having each 'decision' as a seperate four-point rhetorical objective might be a good idea. Any player can argue for any decision (gates, scouts, tunnels, shujenga), but if, at the end of a turn, any objective has 4 or more points on it, then the matter is closed in favour of whichever side has the highest score at that time. The mass battle felt very slow. Partly it was the sheer number of moving parts. With 5 enemy commanders and 4 friendly commanders, each turn had 9 characters acting. It might be worth bundling several of them together and having 3-4 of the enemies just do 'Rally' actions to support the 2 or so characters actually doing Assault actions, in the same way a minion squad works. In practice that means any assault which doesn't do at least 15 (!) casualties - eight bonus successes - hands the Watchtower command 'draw them in' immediately. Equally, since you need to do 10 extra casualties, capture a position is next to unachievable. Panic felt slightly pointless; the samurai remove panic in job lots (4-5 panic per opportunity spent thanks to their army rule) whilst the horde has a discipline of 80. Compared to this, the odd point of panic from opportunity doesn't seem important. Add this to the fact that some things cause panic and others casualties (the 'generic samurai army' archers cause panic, not casualties, for example), maybe a combined value for 'army strength' representing both numerical strength and fighting spirit might work? The challenge rule worked well - Akodo Tsubasa basically turned Teeth-taker into chopped meat in the first round; with an impressive string of bonus successes he caused a nasty critical, and Teeth-taker rolled so many strife on exploding successes on the fitness test to mitigate the first critical that he was hit by a finishing blow which left him with bleeding and dying (1 round). Tsubasa was left on literally strife=composure himself as a result, which was a problem the following round when Moto Morikazu came in and challenged him. Fortunately I forgot the rules for his horse disorienting people or it could have been even worse than it was. Hida Takeshi 's infantry and Kaiu Daisuke's artillery did most of the work - the latter managing a string of exploding succeses which did a lot of casualties - nearly wiping out the shadowlands horde by the end of turn 2 (for some reason the army is only strength 35, which isn't enough to absorb assault actions from 3 players plus the extra 15 automatic damage from the Nezumi and Kaiu Masae's trap). The players kept wanting to do things at personal scale which didn't really translate to a mass combat action. Shiba Mishiko quite correctly pointed out that since 'magic mud' isn't actually magic (it's basically naphta-soaked clay smeared on a goblin and set alight) her extinguish invocation should be a really good ability (given that I described Old Prickly's front line lighting up as the goblin bezerkers charged), but I'm not sure how to translate that into a mass combat action. Be ready to change the required skill for an action. Sakae, the Maho Witch, has a lot of minor Oni in her lines, so using something like theology instead of command would make sense. Part of it, I think, is unfamiliarity with the rules; we only have one die roller and I'm forever flicking back and forth in the rules printout to get the mass battle rules, or one of the commander's stats, or an opportunity table. More play aids and a bit more time between scenes would probably make it easier. And finally Session 4, where we finished the adventure. We had a slight change of personnel - Akodo Tsubasa's player was absent, but Bayushi Nobunaga's (for the first time) wasn't. We essentially picked up after the 'end-of-scene' of the mass battle. Akodo Tsubasa and the Nezumi had inflicted heavy casualties but been forced back into the tunnels (and hence not appearing in this session). The Skeletal Skirmish began Shiba Mishiko trying to apply First Aid to Hida Takeshi. He was less pleased when she fluffed her Medicine check completely and didn't help in the slightest. He was most pleased this ability was added in the beta update. At this point, five skeletal Bushi and Sakae clambering over the wall, and every nearby Crab samurai being too overwhelmed with their own opponents to stop them. Sakae and 2 of the Skeletal Bushi turned and moved towards the tower, leaving a squad of 3 to delay Mishiko and Takeshi. Shiba Mishiko tried to use Tempest Of Air and...basically failed. She did get an opportunity, so I let her spend that to aid Takeshi's attack. Hida Takeshi moved up (somewhat irked that he needed to use Water stance to reach them and strike in the same turn, as it's not his strongest ring, and there is no longer any equivalent of the Charge action allowing him to move more than 2 range bands and still strike. It was pointed out that you can get free moves with water opportunity, which earth can buy at 2-1 cost. Even in Water Stance, one of the skeletons was swiftly reduced to powder by a double-handed otsuchi swing. The other Skeletal Bushi attacked Takeshi, doing 2 wounds past his armour and putting him within 2 wounds of being incapacitated. At this point, there was a sort of 'the eagles are coming' keen from a hawk overhead, and Nobunaga appeared (presumably leap-of-faith-ing off the watchtower into some convenient straw and/or otsuchi-pulverised goblin corpses). He used his bow, and managed to wound Sakae (but not substantially). Yasoroku flew past the skeletons to attack Sakae - it didn't reach her but would the following turn. I didn't make him make a specific check to 'command' the hawk because, in this case, Sakae was the only living opponent, and Yasoroku had just seen his owner attack her. Sakae used her Maho ability to raise three Zombies, who formed a 'second line', and moved further towards the tower. Shiba Mishiko used her Grasp Of Earth ability...and didn't roll well. Being told about 'channeling dice', she held on to the only success she'd rolled to try again. Takeshi pulverised a second skeleton, now in earth stance and able to use his impressive Rank 4 ring to land a satisfying number of explosive successes. Nobunaga fired again, but missed (although he did assist his hawk's attack). The zombies attacked Takeshi and got 1 damage past his armour, taking him literally equal to his resiliance! Sakae moved to range 0 of the tower, opening the watchtower gate and being ready to disappear inside if not stopped this turn. Mishiko used Grasp of Earth again, passing this time (in part thanks to the channeled die), doing 2 damage and immobilizing the last skeletal bushi. Takeshi continued playing whack-an-undead, moving on to the Zombies (trying to reduce their numbers so they didn't get too many assist dice and wouldn't be able to get through his armour). A water stance calming breath brought back a point of fatigue. The Skeleton - immobilized and prone and not at range 1 of anyone, rattled menacingly couldn't do anything else. Nobunaga hit this time, landing more wounds on Sakae and incapacitating her right at the gateway to the tower. The Hawk attacked her,landing a much more impressive critical that even with her fitness roll was reduced to 'injured jaw' as the hawk ripped at her face. Sakae was incapacitated, trying in vain to fend off the frenzied hawk. A calming breath action healed a wound but didn't take her out of incapacitated yet. Shiba Mishiko went a bit Berric Dondarrion, using Biting Steel and (thanks to an opportunity allowing a free strike) shoved her burning Wakizashi through the remaining Skeletal Bushi. Between two explosive successes, her Fire rank of 3, Fire Stance turning strife into bonus successes and Biting Steel's damage bonus, the skeletal minion basically exploded into shards. Takeshi flattened another zombie. Earth 4, Martial Arts Melee 1 and an Otsuchi against minions with only a Resiliance 4 could, I guess be considered overkill. Nobunaga....missed again. But did assist Yasoroku, as the hawk continued to rip into the witch. Yasoroku screeched and ripped at Sakae's head - landing a hit and getting enough opportunites for a second critical. The first - a Maiming Blow - ripped out Sakae's tongue (Muteness) and rendered her unconcious whilst the second (now increased by the improved critical bonus and untempered by a fitness check) caused an Agonising Death. The rest of the PCs were looking very askance at how lethal the hawk was! The change of scene let the players dump some strife (Nobunaga and Mishiko had particularly been using fire stance quite a bit, so were very glad of this!) as the action moved to the commander's balcony of the Third Watchtower, and Kazanagan no Oni burst into being. Hida Tomonatsu and Keinosuke charged it as the PCs arrived. The heroic charge didn't go well. Kanazagan no Oni backhanded the charging Keinosuke, incapacitating the ex-ronin, , knocking him Prone and inflicting Burning. Tomonatsu did land a critical, damaging the Oni's armoured hide, and then ducked under the gout of magma-blood. Fortunately, at this point, the PCs arrived, and at the same moment, the Jade Labyrinth pinned it in place. Shiba Mishiko re-ignited her sword's blade. Takeshi also thumped it with his otsuchi, doing a fair amount of damage and wrenching a sizeable wound in the armour of its chest. He failed to avoid the burning blood, but since Kanazagan no Oni's own fitness check had reduced the severity to zero, took no damage. Keinosuke died horribly from his burns, slumped against the watchtower's battlements. Kanazagan no Oni turned on the Watchtower commander, wounding her (but not critically). Tomonatsu in return took a fair chunk of wounds off the Oni with a double-handed swing. Nobunaga managed a hit, doing a fair amount of damage. Once again the Hawk dove in and landed a faintly ridiculous 4 explosive successes, rolling into two opportunities, tearing off the Oni's hand and leading to it collapsing unconcious, and landing a fatal blow with the second critical. At this point, the battle was clearly won. They checked on Tomonatsu and offered first aid, and discovered Keinosuke dead. As Nobunaga's player noted, 'Bird Is Apparently The Word', with the Hawk having made mincemeat of both adversary-level opponents and basically completely shown up all three of the PCs! * Let me make this clear: Bayushi Nobunaga somehow missed a thirty-foot high, immobilized target from less than ten metres away. ** It should also be noted that Mishiko's player (my wife) has some standing issues with Birds and Birdlike things in RPG campaigns she's played in, from Kroot mercenaries hunting down the party and Tzeenchian Daemons turning out to be impersonating the party members*** in 40k RPGs to a rampaging Giant Radioactive Dodo**** in Paranoia, and her reaction to encountering a non-evil, non-daemonic, non-monstrous bird that not only was on their side but can reasonably be claimed to have won the battle for them was amusing to watch. *** Not their fault, but fun to watch when they found out! Long story. **** Totally, totally their fault. Even longer story.